It's bright orange for high visibility, lighter for easier handling, stronger for better performance and very cost effective. 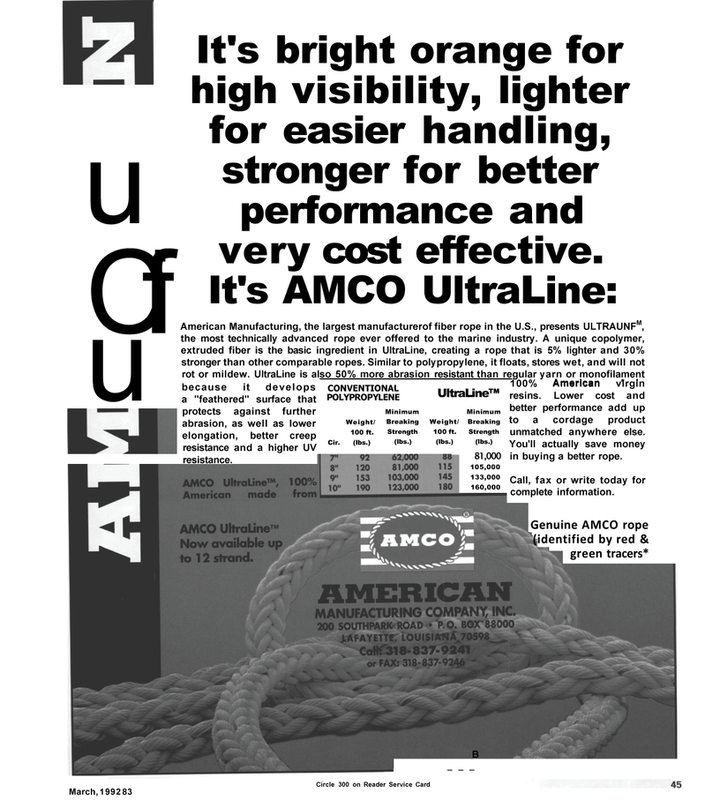 American Manufacturing, the largest manufacturerof fiber rope in the U.S., presents ULTRAUNFM, the most technically advanced rope ever offered to the marine industry. A unique copolymer, extruded fiber is the basic ingredient in UltraLine, creating a rope that is 5% lighter and 30% stronger than other comparable ropes. Similar to polypropylene, it floats, stores wet, and will not rot or mildew. UltraLine is also 50% more abrasion resistant than regular yarn or monofilament American * ' because it develops a "feathered" surface that protects against further abrasion, as well as lower elongation, better creep resistance and a higher UV resistance. Breaking Weight/ Breaking 100 ft. Strength (lbs.) (lbs.) 81,000 105,000 133,000 160,000 100% America virgin resins. Lower cost and better performance add up to a cordage product unmatched anywhere else. You'll actually save money in buying a better rope. Call, fax or write today for complete information.